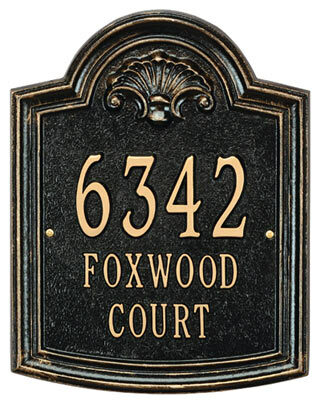 The classic arch of the Elderwood Standard address plaque is enhanced with the shell motif which dates back as early as the Greco-Roman era where it was used in many architectural pieces. 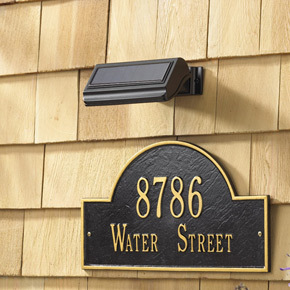 The elongated three line plaque creates a tablet effect to stately announce your address. 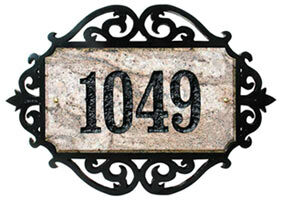 Shown in Black with Gold Letters, the Elderwood address plaque comes in 5 finish combinations. 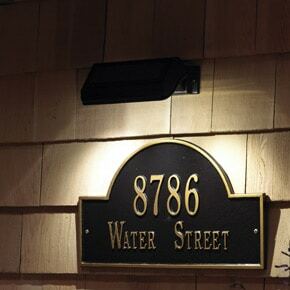 The Elderwood Standard Address Plaque holds up to five 3″ numbers on the 1st line and up to twelve 1.25″ characters on the 2nd and 3rd lines. 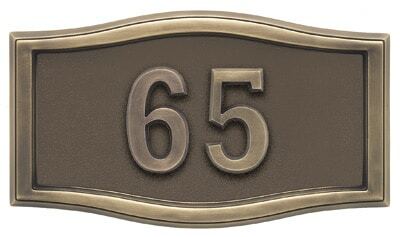 The Elderwood Estate Address Plaque holds up to five 4″ numbers on the 1st line and up to twelve 1.75″ characters on the 2nd and 3rd lines. Standard Size Plaque 14" 11" 0.5"
Estate Size Plaque 18.875" 14.875" 0.5"